Perspectives on Conceptual Change presents case study excerpts illustrating the influence on and processes of students' conceptual change, and analyses of these cases from multiple theoretical frameworks. Researchers in reading education have been investigating conceptual change and the effects of students' prior knowledge on their learning for more than a decade. During this time, this research had been changing from the general and cognitive--average effects of interventions on groups of students--to the specific and personal--individuals' reactions to and conceptual change with text structures. Studies in this area have begun to focus on the social, contextual, and affective influences on conceptual change. These studies have potential to be informed by other discourses. Hence, this book shows the results of sharing data--in the form of case study excerpts--with researchers representing varying perspectives of analyses. Instances of learning are examined from cross disciplinary views. Case study authors in turn respond to the case analyses. The result is a text that provides multiple insights into understanding the learning process and the conditions that impact learning. "The chapters grew out of a unique and interesting idea by the two editors to present four case studies of student learning…and then have researchers from various theoretical perspectives write chapters…in which they react to and analyze these vignettes in terms of their own models and constructs….The dialogue that emerges from this fascinating experiment provides a Rashomon-like experience, where all the chapters are viewing the same 'data'…but obviously looking at them from their own window or perspective….the chapters in this book do provide all of us researchers interested in conceptual change with a chance to look out different windows and see which view we think is most useful and attractive to us." Contents: M.Y. Lipson, Foreword. Preface. Part I:The Vignettes. B. Guzzetti, Case Studies in Conceptual Change: Contextual Influences on Learning With Text. K. Maria, Self-Confidence and the Process of Conceptual Change. E.B. Moje, D.P. Shepardson, Social Interactions and Children's Changing Understanding of Electric Circuits. C. Hynd, Conceptual Change in a High School Physics Class. Part II:Perspectives on Conceptual Change. G.M. Sinatra, J.A. Dole, Case Studies in Conceptual Change: A Social Psychological Perspective. P.A. Alexander, Positioning Conceptual Change Within a Model of Domain Literacy. C.A. 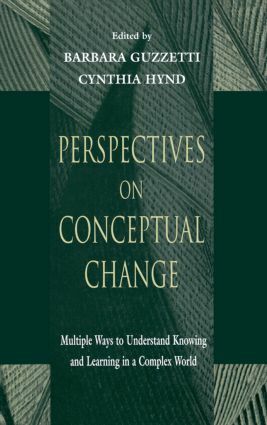 Chinn, A Critique of Social Constructivist Explanations of Knowledge Change. K.H. Au, Conceptual Change From the Perspective of Multicultural Education. P. Anders, M. Commeyras, A Feminist Commentary on Four Science Education Vignettes. G.J. Kelly, J. Green, The Social Nature of Knowing: Toward a Sociocultural Perspective on Conceptual Change and Knowledge Construction. J. Myers, D. Alvermann, A Critical Postmodernist Perspective on the Vignettes of Conceptual Change. Part III:A Response by the Vignette Authors. B. Guzzetti, Marcey and Oz: Can Conceptual Change Occur Through Gendered Interactions? K. Maria, My Analysis of the Jennifer Vignette. E.B. Moje, D.P. Shepardson, Social Interactions and Children's Changing Understanding of Electric Circuits: Exploring Unequal Power Relations in "Peer"-Learning Groups. C. Hynd, Observing Learning From Different Perspectives: What Does It Mean for Barry and His Understanding of Gravity?